This illustration shows a Breakthrough Starshot nanocraft, which could travel to the star Proxima Centauri, where a potentially Earth-like planet was recently discovered. A potentially Earth-like planet has been discovered orbiting a star located right next door to the sun. Should humanity try to send a probe there as soon as possible? The newly discovered planet, known as Proxima b, orbits the star Proxima Centauri, the closest star to the sun. Proxima Centauri is about 4.22 light-years — or 25 trillion miles (40 trillion kilometers) — from Earth. The postage-stamp-sized space probes of Breakthrough Starshot could make a flyby of planets around Alpha Centauri within 20 years after launch. See how Breakthrough Starshot could work in our full infographic. In 2015, NASA's New Horizons probe completed its 3-billion-mile (4.8 billion km) journey to Pluto after traveling for about 9.5 years. The spacecraft traveled at speeds topping 52,000 mph (84,000 km/h). At that rate, it would take New Horizons about 54,400 years to reach Proxima Centauri. In other words, sending a probe to the nearest star system would not be easy. The founders of the Breakthrough Starshot initiative want to send wafer-thin probes to Proxima Centauri at very high speeds. The plan calls for equipping these probes with thin sails, which would capture the energy imparted by a powerful Earth-based laser. This laser would accelerate the probes to 20 percent the speed of light (about 134.12 million mph, or 215.85 million km/h), according to the program scientists. At that rate, the probes could reach Proxima Centauri in 20 to 25 years. But first, scientists and engineers have to build the apparatus that will launch the tiny probes on their journey. 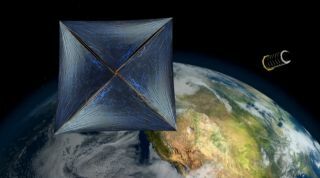 In a news conference today (Aug. 24), Pete Worden, chairman of the Breakthrough Prize Foundation, said that a group of experts had convened earlier this week and discussed plans to build a prototype of the Starshot system. However, he added that the full-scale apparatus is at least 20 years off. "We certainly hope that, within a generation, we can launch these nanoprobes," Worden said. "And so perhaps 20, 25 years from now, we could begin to launch them, and then they would travel for 25 years to get there." He added that building the full-scale apparatus would likely cost about the same as building the Large Hadron Collider, the largest particle accelerator in the world; that project is estimated to have cost about $10 billion. "Over the next decade, we will work with experts here at ESO [the European Southern Observatory] and elsewhere to get as much information as possible about the Proxima Centauri planet … even including whether it might bear life, prior to launching mankind's first probe towards the star," Worden said. The New Horizons mission to Pluto was a good demonstration of the benefits of sending a probe to study a planet (or dwarf planet). Images of Pluto captured by the world's most powerful telescopes could barely resolve any surface features on the icy world. During its 2015 flyby, New Horizons provided an incredibly detailed view of Pluto's surface and a boatload of new information about its history. Could a wafer-thin probe sent to Proxima Centauri b reveal similar details about the planet, or perhaps even reveal the presence of life? There would be some significant limitations to how much information the probes proposed by Breakthrough Starshot would be able to send back to Earth. First and foremost, the data would take 4.22 years to travel back to Earth, on top of the 20 to 25 years it would take the probe to get to Proxima Centauri. Seth Shostak, a senior astronomer at the SETI Institute (SETI stands for "search for extraterrestrial intelligence"), told Space.com that the prospect of sending a miniature probe to Proxima Centauri is "even more interesting now than it was ... six months ago because now we know there is a planet there." "I think [the discovery of Proxima b] has real implications for sending something physical to the star system because now there's a target of interest," Shostak said. But he also brought up some of the unknown variables that people will have to consider when investing in Breakthrough Starshot, including what kind of information the probes could send back from the planet. Those wafer-thin probes would have to carry very small instruments, and thus might be able to do only a very rudimentary study of a planet or star. It's difficult to predict the exact technology that would be on board, because electrical components and other technical gear will likely continue to shrink in size over the next 20 years. Scientists and engineers would have to consider whether, in the time it would take for information to come back from a probe sent to Proxima Centauri, they could build a telescope capable of gathering the same information. Penelope Boston, director of NASA's Astrobiology Institute, thinks the continuing trend of hardware miniaturization will make it possible to equip a wafer-thin probe with instrumentation that would make a trip to Proxima Centauri well worth the investment. Boston said the intricate details of a planet's surface can create a huge variety of specific habitats, and resolving the details of those environments on a planet outside Earth's solar system is "certainly beyond the resolution of any conceivable telescope." "I see the trends in all different kinds of instrumentation going in a kind of ['Star Trek'] tricorder direction, where you have more and more capability packaged into ever-small physical space," Boston told Space.com.